« You can help make a difference. Butternut squash Faux-sotto. Almost as good as the real thing. As promised, the second half of the butternut squash saga. The first half, of course, included the squash mash. For the second installment, I wanted to do a healthy take on risotto. I’ve been eating like a heifer lately, so it was time to trim it down. 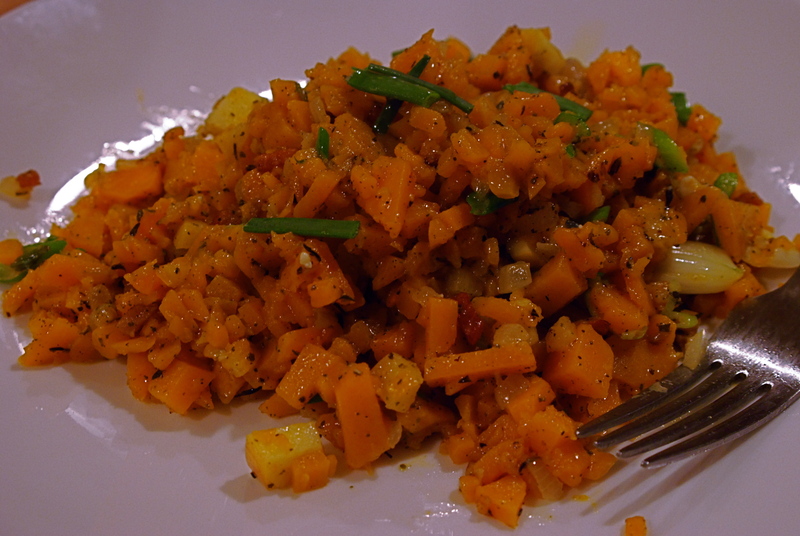 I decided that it might be interesting to try to use butternut squash as a substitute for the rice. The challenge: getting the squash to stay al dente while being cooked. Since I was using a lot of squash, which is pretty sweet when cooked, I needed some additional flavoring that would complement the dish well. I decided to go with some great tamarack farms bacon (I mean, why not), onion, garlic, and rubbed sage. For a twist– instead of parmesan and butter, I decided to use blue cheese for the richness, which I felt would add some tang to the dish. 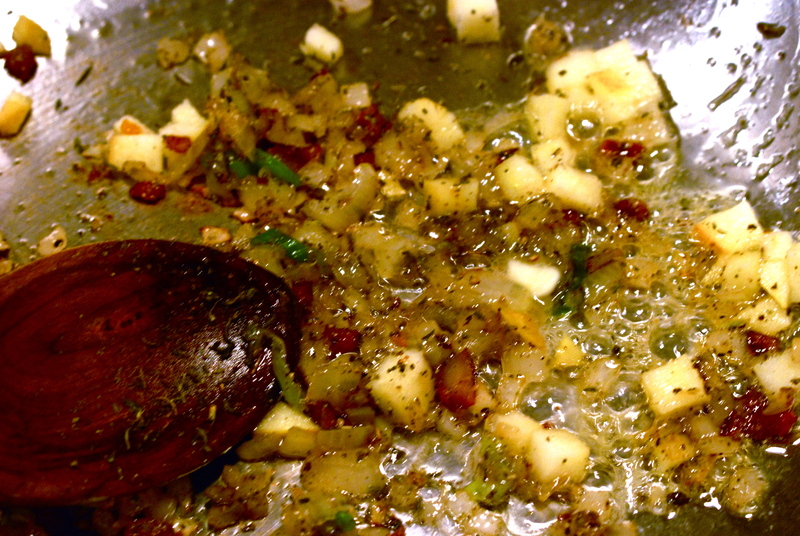 Then some fresh green onions and chopped apples to brighten it up a bit. Since I don’t have a ricer, I had to cut all of the squash by hand. As you all know, I am a master with a knife, so this was a piece of cake. Actually, it was a PITA. 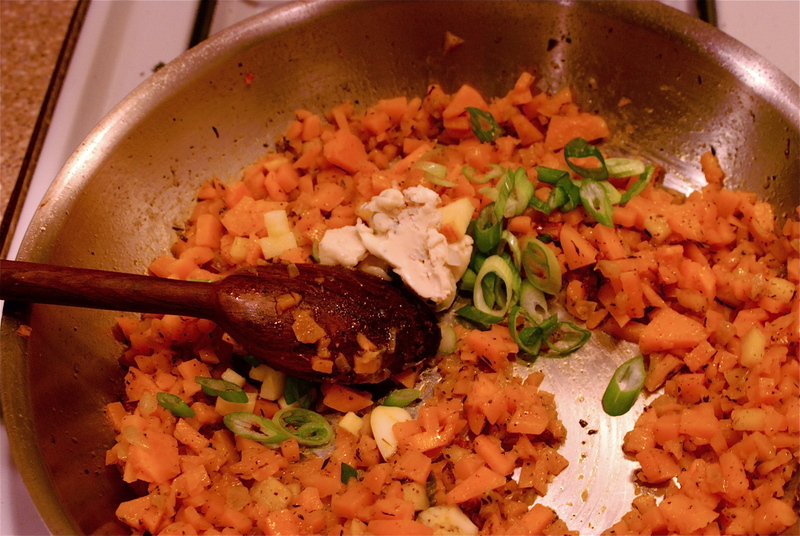 I wanted a good mixture of small pieces that would be the “rice,” while some larger chunks would add some of the texture and really make the butternut squash stand out. When it was done, it looked like a bunch of cheddar cheese, but smelled like a pumpkin carving contest. With the squash ready, it was time to start building the base flavors in the pan. First step: BACON. First of all, this Tamarack Hollow Farm bacon is just tremendous. 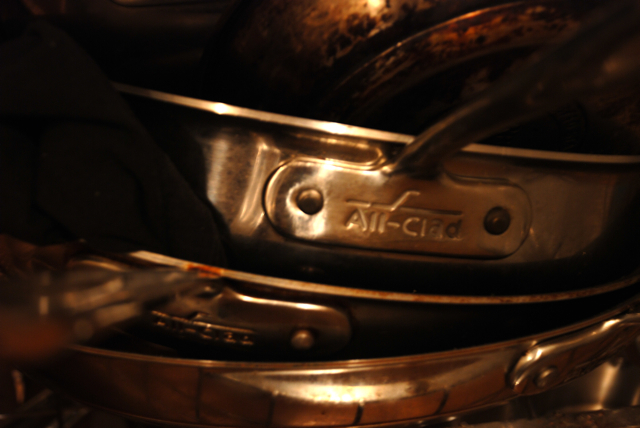 It crisps up perfectly, but retains a nice chewiness that melts in your mouth. These guys are another example of a small step doing something great– the couple that owns the farm up in Vermont basically bought a couple of pigs so that they could eat ethically-raised meat, despite their long distance away from such a food source. Great story, and from the looks of things and the positive press that they are getting, it’s working out for them. 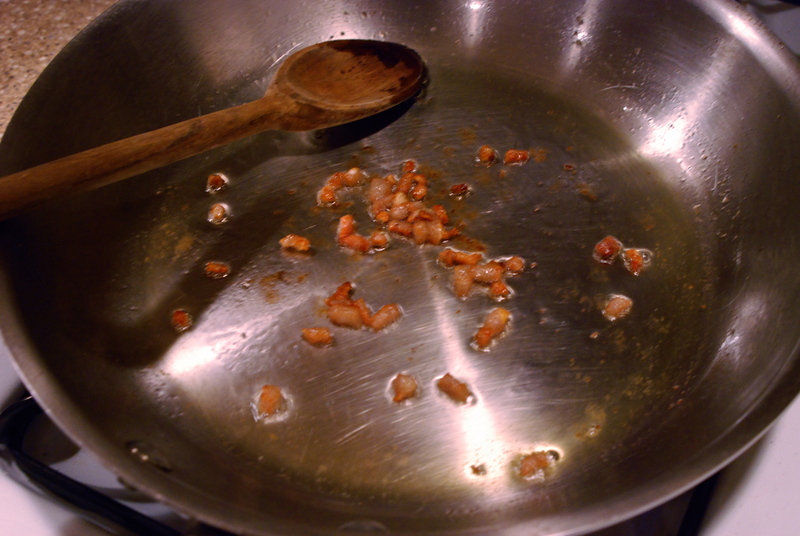 I made only a few some small lardons and rendered some of the fat. Being a healthy recipe, I didn’t want to use too much fat in the dish, especially since it was going to be finished off with some blue cheese. After this had rendered a bit, it was time to add some onion (some of those green bits are scallions that got mixed up on the cutting board), and then finish that off with a quick dusting of rubbed sage. I only had the dried stuff, but in this case I think it worked out. After cooking this stuff until just tender, it was time to add the butternut squash. Everything was smelling great and it was time to pump up the party. After adding all of the squash, I realized that this was not going to cook quite as I had hoped. 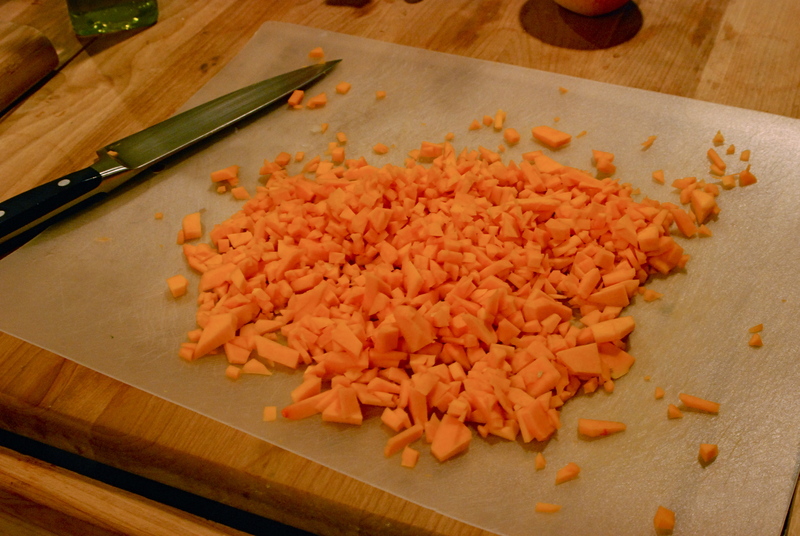 The small pieces would cook through, but the bigger chunks would not cook all the way through. I realized I was going to have to take a risk and add a liquid, much like a traditional risotto would. My fear was that this would make everything turn to mush, so I was very light-handed with the liquid I added. Knowing that the dish had enough flavor as it was, I was ok with adding water, but I would have preferred to maybe use some veggie stock. I added it slowly and cooked it off just like real risotto. As my boy on Chef Academy says, I put in the crushed garlic in at the end of the cooking process. Lastly, when everything was cooked through to my liking, I added the blue cheese and the green onion, finished it up with a few of the chopped apple chunks. DONE. Delicious. And pretty healthy (I think). Tender bits of butternut squash mixed in with more al dente bits, all coated in a light layer of creamy blue cheese (saga blue). A little brightness and some of that allium-flavored goodness. A few cracks of black pepper and some sea salt to finish, what a masterpiece. Definitely will be making this again. Tags: butternut squash, cooking, tamarack farm. Oooh, I love the idea, will have to give it a try. Do you think it would work without cheese for those people cutting out dairy? Definitely! As you can see from the photo, the blue cheese is really just a small dollop for some fattiness. It might require some trial and error, but since the recipe is pretty leanl, you might want to finish it up with a little glug of olive oil and an extra pinch of salt. Let me know how it goes! Dude, mad props on the innovation tip…I really dig the play-by-play…how do you manage to snap pictures throughout the cheffin’-up process? 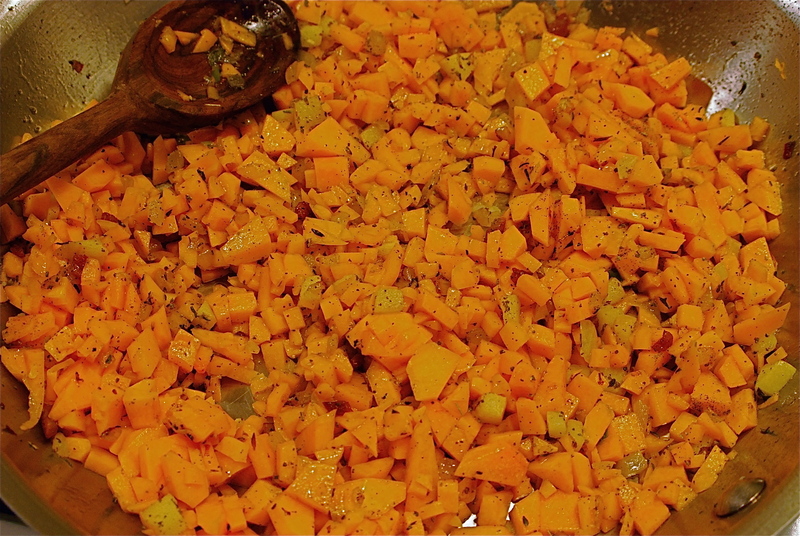 I’d really like to try this recipe out…lets acquire some squash at the market on Wednesday!